The problem with this concept is that it is a ridiculously one-sided and misleading take on fundamental uncertainty. “Uncertainty” in the sense used here is uncertainty that cannot be objectively quantified and might come in various qualitative degrees, from total uncertainty to some low degree of uncertainty, to which economic agents are subject and which affects their expectations and decision-making, and above all the decision to invest. Of course, it is perfectly possible for governments to create uncertainty, but it is just as possible for them to reduce uncertainty as well. Above all, the private sector itself and the unintended consequences of decision-making by millions of private agents can create uncertainty – and often severe uncertainty too. Conditions in the private sector during the US Great Depression – such as falling demand, falling asset markets, deflation, debt deflation, and banking and financial instability – especially in its contractionary phase (1929–1933) were a great source of business uncertainty which also persisted after 1933. Any analysis of the 1930s that ignores this is fundamentally flawed. It speaks volumes that libertarians want to limit uncertainty to that caused by the government, and the weakness in their use of “regime uncertainty” can be seen in the way they apply it to the Great Depression (e.g., Higgs 1997; Woods 2004: 149; Murphy 2009: 113–118). “Economic historian Robert Higgs has argued that ‘regime uncertainty’ also hindered recovery. Businessmen and investors, unsure of what the federal government would do next and what additional punitive measure would be imposed on them, simply stopped investing.” (Woods 2004: 149). The claim that US businessmen and investors “simply stopped investing” in the 1930s under Roosevelt is a bold one, but, as we will see, is utterly untrue. In essence, the libertarians want to blame the US government for the failure of the US economy to recover to full employment after 1933: according to the libertarian view, private capitalists did not want to invest, and this was either wholly or mainly the fault of government deficit spending, regulations, anti-business court decisions, pro-union policies, and so on. Now, while some of the government interventions under Roosevelt probably did have negative effects on business expectations in the 1930s, and indeed Keynes himself pointed to some of the unproductive aspects of the New Deal (Skidelsky 1992: 508), nevertheless that effect is grossly exaggerated. What is the evidence for this? 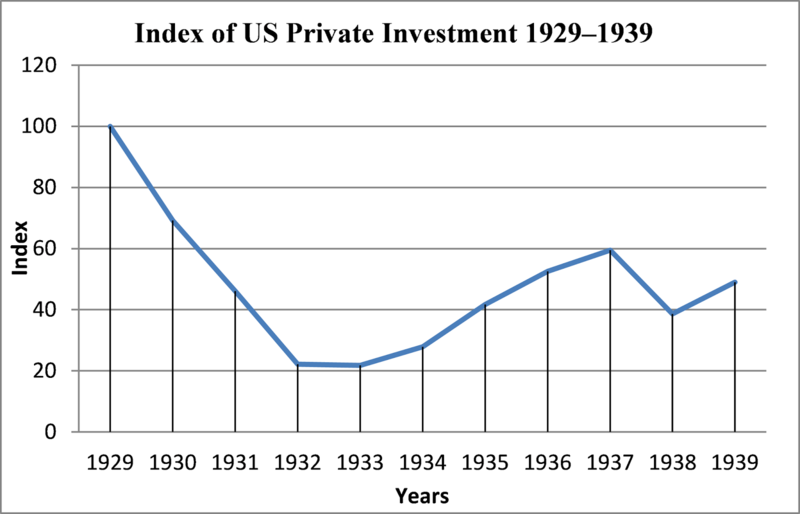 We need only look at an index of US private investment in the 1930s, as below (with data from Amaral and MacGee 2002: 48, Table I). The data can also be seen below in Appendix 1. As we can see, as Roosevelt come into office and deficit spending and regulations were increased, US private investment actually recovered and was rising to such an extent that by 1937 it had risen from 21.8 to 59.5. It is plainly nonsensical to say that US businesses and investors “simply stopped investing” under Roosevelt. If that were true, then we would see a flat or falling line in the graph above in the period after 1933. And even under the preferred libertarian measure of net investment (adjusted for capital consumption allowance), US investment was positive in 1936 and 1937 and after the resumption in fiscal stimulus after 1938 (Higgs 2006: 7). It is true that it was negative in 1934 and 1935, but even that does not change that fact that gross investment started rising from 1933 and continued rising until 1937. Unfortunately, it was in 1937 that Roosevelt, instead of pursuing continuing fiscal stimulus or (better still) increased stimulus, turned to budget balancing and contractionary fiscal and monetary policy, and the result was that he induced a second recession from 1937 to 1938 (the so-called “Roosevelt recession”). 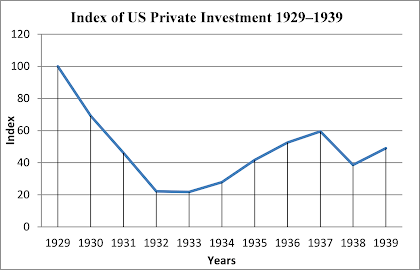 The result was that US gross and net private investment fell in 1938. It then resumed growth after 1938 when Roosevelt shifted back to expansionary fiscal policy. The actual data shows the opposite of what we would expect if the private sector was really “uncertain” and totally or largely unwilling to invest when the government was engaged in deficit spending and other interventions. And even in those sectors where opposition to the New Deal was strong, there is still little evidence that these industries refused to do business or increase investment when the fiscal effects of the New Deal caused demand for their output to rise. In short, “regime uncertainty” as the main explanation of why the US failed to achieve full employment under Roosevelt is just ideological libertarian nonsense. The answer is that private investment is an important metric and one chosen by the Austrians and libertarians themselves in their attempts to spin their stories about “regime uncertainty.” As we have seen, the evidence does not support them. 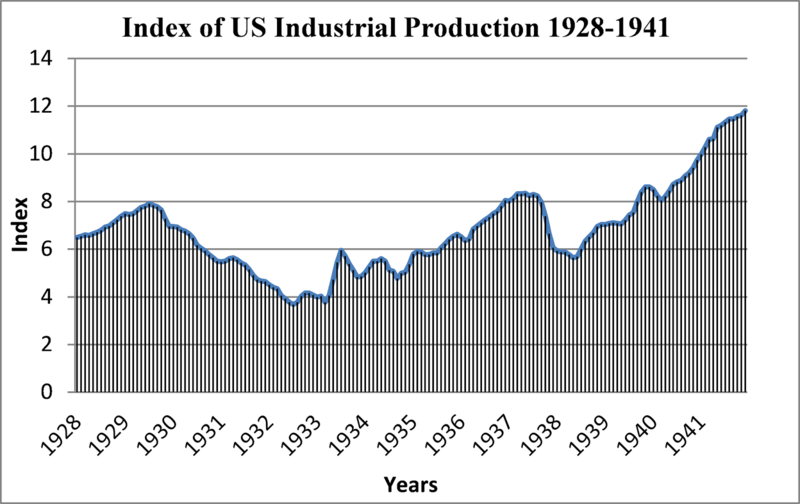 But what about the Federal Reserve’s index of US industrial production? We can see a graph of the Fed’s index of US industrial production below from 1928 to 1941 (the seasonally adjusted data can be seen here). And for clarity a graph of the 1933 to 1937 period. It is true that there were two curious periods in 1933 and 1934 when industrial production contracted. From April to July 1933, a strong expansion in output occurred. But this was derailed from August to November 1933 as industrial output fell. However, output rose again from December 1933 until May 1934, but then fell again from June down to September 1934. From October 1934, there began a clear upwards trend and expansion – apart from a few months of flat growth in early 1935 and a few months of contraction late in 1936 – that continued right up until the middle of 1937, at which point Roosevelt’s austerity induced a second recession. The Fed’s index of US industrial production shows us a clear trend of recovery in industrial output from October 1934 right up until Roosevelt’s fiscal and monetary contraction. From August 1933 until September 1934 it is true that there were two periods of contraction in industrial output. Exactly why this happened is an open question, but at the same time industrial output fell in these periods, annual gross private investment was still rising, and overall the long-run trend in the data from 1933 until 1937 – whether real GDP, industrial output, private investment, or unemployment – shows a recovery, not stagnation or contraction. In fact, in December 1936, industrial output (at 8.0522 in that month) surpassed its 1929 peak (which was 7.918). 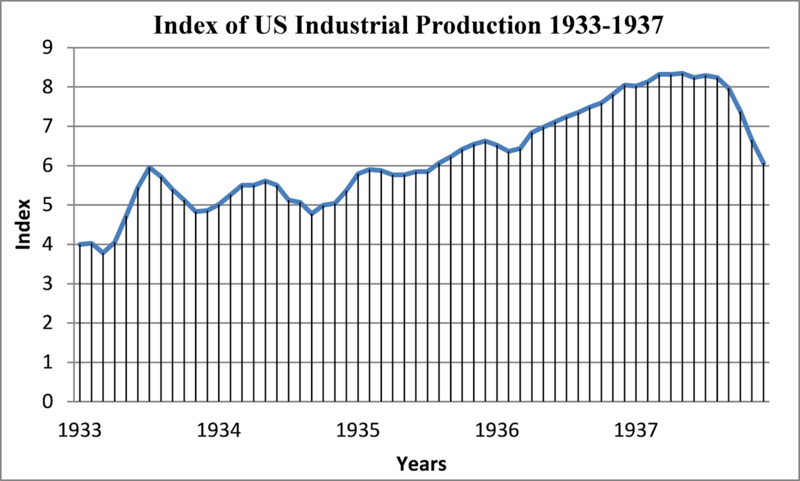 Moreover, when Roosevelt’s fiscal expansion was resumed in 1939, industrial output, as we can see in the first graph, continued to strongly recover – utterly contradicting the Austrian/libertarian narrative. Amaral, P. and J. MacGee. 2002. “The Great Depression in Canada and the United States: A Neoclassical Perspective,” Review of Economic Dynamics 5.1: 45–72. Higgs, Robert. 1997. “Regime Uncertainty: Why the Great Depression lasted so Long and Why Prosperity returned after the War,” Independent Review 1 (Spring): 561–590. Higgs, Robert. 2006. Depression, War, and Cold War: Studies in Political Economy. Oxford University Press, Oxford. Levy, L. W. et al. (eds), Encyclopedia of the American Constitution (vol. 1), Macmillan, New York. Woods, Thomas E. 2004. The Politically Incorrect Guide to American History. Regnery Publishing, New York. You say "Unfortunately, it was in 1937 that Roosevelt, instead of pursuing continuing fiscal stimulus or (better still) increased stimulus...."
What kind of non-fiscal stimulus did you have in mind (or is that just a typo) ? Oh, I see it was reading error, you mean increasing stimulus rather than just continuing with the existing levels. Lord Keynes, why use yearly data if there's monthly data available? The Fed's Index of Industrial Production (not exactly investment, but correlated enough with it) shows a sharp and sudden spike in industrial production from April to July of 1933, and then stagnation for two whole years. Then came a malinvestment-fueled boom which ended in a great crash in the second half of 1937. There was some recovery after that (though not back to the 1929 level), and then WWII began. A great success story this isn't, except for the first five months of the Roosevelt administration, which, I have to admit, is the greatest period of recovery in American history. It involved no significant quantitative monetary stimulus (only an end to the money supply decline), and no greater deficit spending than achieved in parts of Herbert Hoover's term. (1) "There was some recovery after that (though not back to the 1929 level), "
No, in December 1936, US industrial output surpassed its 1929 peak (which was 7.918). (2) "The Fed's Index of Industrial Production (not exactly investment, but correlated enough with it) shows a sharp and sudden spike in industrial production from April to July of 1933, and then stagnation for two whole years. " It does not shows stagnation for "for two whole years". 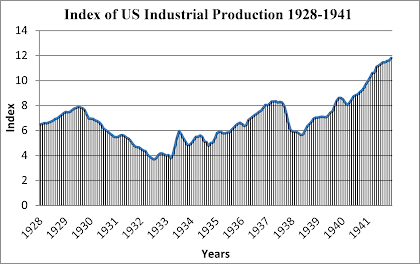 It shows that from August 1933 until September 1934, that there were two periods of contraction in industrial output but preceded by expansions. But from October 1934, there began a clear upwards trend and expansion – apart from a few months of flat growth in early 1935 and a few months of contraction late in 1936 – that continued right up until the end of 1937, at which point Roosevelt’s austerity induced a second recession. Overall, the long run trend in the data – whether real GDP, industrial output, private investment, or unemployment – from 1933 until 1937 shows a recovery, not stagnation or contraction. In July 1933, it was 5.9586. In July 1935, it was 5.8513. No matter what contractions and expansions occured between those months, that's called stagnation in my book. I pretty clearly wrote "after that"; i.e., after the "great crash in the second half of 1937". And yet you don't admit your mistake: "There was some recovery after that (though not back to the 1929 level)." Yes, there was by December 1936. 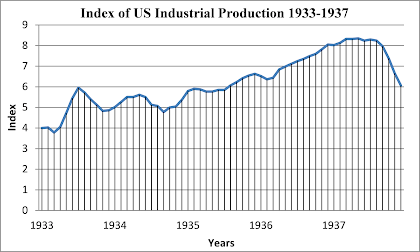 The fact is, whether you think industrial output stagnated from 1933-1935 or not (and this is something that can be disputed in the data), that there is a clear upwards trend from October 1934 and that continued 1937. As I said, overall the long-run trend in the data from 1933 until 1937 – whether real GDP, industrial output, private investment, or unemployment – shows a recovery, not stagnation or contraction. Also, since when did Austrians support tax increases, which were the main bit of contractionary policy in 1937? the crash of 1938 was caused by contractionary fiscal and monetary policy. So are you saying that you agree that contractionary fiscal policy is likely to cause recession? lol. I'm not aware of a single case in which contractionary fiscal policy alone (or even mainly) caused a recession (except for the post-war recessions), but even if it did, Austrians would still not have supported the 1937 tax increases, which were the majority of the 1937 contractionary fiscal measures. So you know of cases when contractionary fiscal policy caused recessions in the post-war period, but you are "not aware of a single case in which contractionary fiscal policy alone"?? lol. Perhaps you should try and grasp the sheer illogic of this statement?